Today is a day to honor and give thanks to everyone who has ever served our country as a member of any branch of the armed services — Army, Navy, Air Force, Marines and Coast Guard. 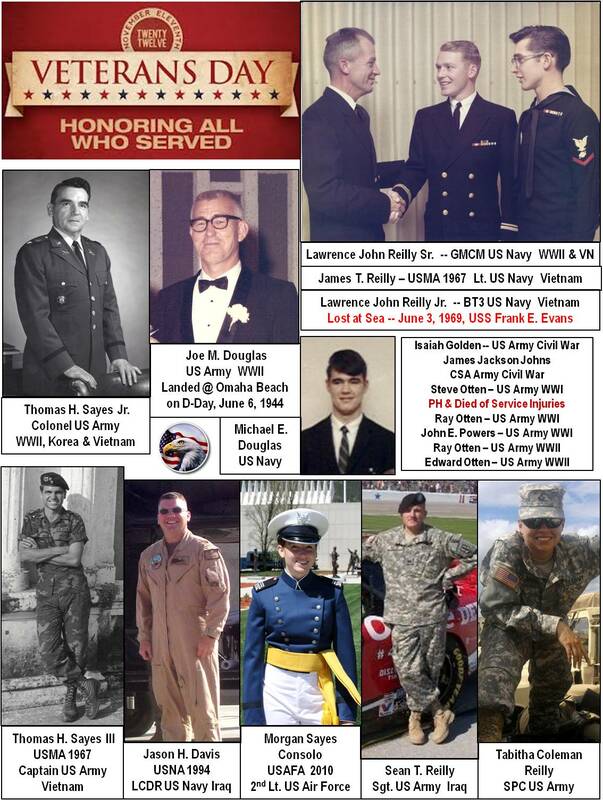 And to give special thanks to the members of the extended Reilly/Douglas & Sayes families who have served — 18 of them altogether, stretching back to the American Civil War (and thanks to my daughter Risa who did the genealogical research which found our Civil War vets). Two of the 18 made the ultimate sacrifice in or as a result of their service — my great grand uncle Steve Otten, who was gassed in combat in France during WWI and died several years later as a result of the injuries to his lungs — and my brother Lawrence John Reilly Jr. who was lost in the collision between his ship, the USS Frank E. Evans, and the Australia aircraft carrier HMAS Melbourne, during a Vietnam training exercise on June 3, 1969.